This is a sustainable programme which was started in 2012. The Centre conducted some activites in designing draft of scripts for video learning model for ILFL. In this phase, the Centre finalised five scripts of video learning model for ILFL under the theme self-introduction, occupation, self-identity, self description, and family. This training held on 21-26 June 2013 at the Pramesthi Hotel, Bogor, West Java. There were 20 education practitioners coming from West Java, Yogyakarta and East Java provinces as well as Centre’s staff took part in this training. In this training, the Centre invited 4 language and multimedia experts from several universities and institutions, namely Mr Sandjaya Siswosumarto (Trisakti University), Mr M.Bundhowi (Association of Teachers of Indonesian as a Foreign Language), Mr Fitra Chairullah (D’Base Production) as well as Dr Felicia Nuradi Utorodewo (SEAMEO QITEP in Language). 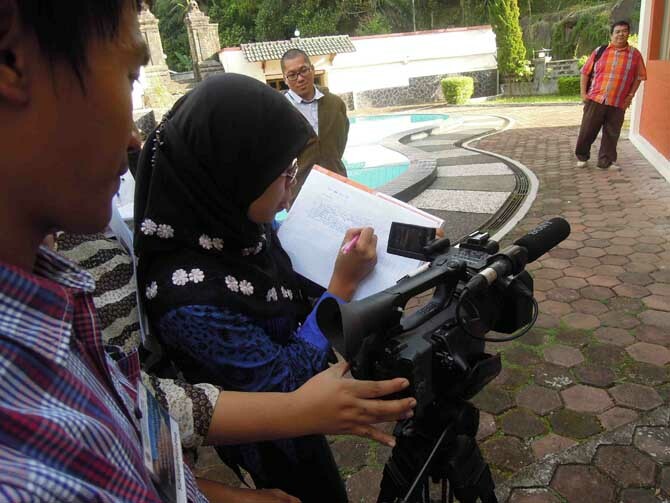 During five days, the participants learned about how to design and produce video script on video compact disk. At the end of the training, the participants also did a simulation in producing the video learning and practised the video editing.